Then on Monday evening the LSE had a seminar by Ian Gordon – very stimulating and data-rich as usual – in which he was trying to work out why London has such high levels of worklessness. Part of the concentration of worklessness is, of course, an illusion because ‘London’ (i.e. Greater London) is just part of the labour market area and the part where the disproportionate amount of worklessness is concentrated. After separating out the part which is identifiable as demand-deficient you are left with the structural/frictional part and the distribution of this is explained purely by characteristics of residents -and/or how employers treat those characteristics. Then on Thursday I spend the morning with Duncan Bowie whose Highbury Group is producing a manifesto on housing for the UK election. Apart from Duncan, only I and James Stevens from the HBF turned up to finalise the draft, the other having emailed comments. It was actually rather enjoyable. James is a kind of independent-minded market-oriented economist that I can sometimes really agree with on some issues and, for example, we saw almost eye-to-eye on the poisonous effects of green belts, conservation areas etc on supply and inequality. The manifesto will not be a revolutionary document but it is quite good strong stuff and I hope that it will help push a bit against the dreadful orhothodoxy that we MUST have state expenditure cuts. Anne Power gave a talk which was rather ambiguous about the benefits and inuries of ‘regeneration’ and got taken to task rather strongly by Richard Lee and Sharon Hayward from the London Tenants’ Federation – getting her to agree explicitly that the effect of inserting other tenures into council estates was seriously negative. I think she was a bit surprised to find tenants sitting in the front row. Indeed it felt as though it wasn’t something that normally happened at LSE – so I felt very pleased at having made sure they got the invitation. 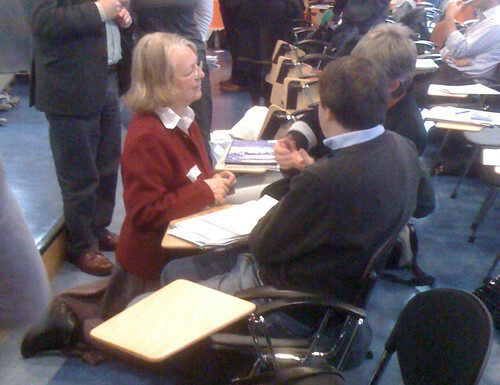 At the end of the meeting it was intriguing to see Anne Power on her knees in discusion with the two of them. Right at the end Nicky Gavron gave qute a “rousing” talk (and she’s resuming the chair of the Assembly planning and housing committee soon). She emboldened me to ask why none of the speakers all day had had the nerve to stick up for state expenditure. All had implicitly or explicitly subscribed to the orthodoxy that massive cuts are essential. She was quite keen on us expressing resistance, and there was some good clapping. Mike Harloe, closing the event, said he thought it would take a combination of strong arguments about the damage done to the economy + a lot of trouble on the streets to get governments to take social housing seriously again. I’ll add to this.